On our last trip to Trader Joe's, Sonia and I decided to brave the high school cafeteria classic, Shepherd's Pie. This dish can be a big hit or miss kind of deal: if it's done right, there's a nice blend of textures and flavors, and a whole balanced meal all mixed together for you right there in one food item. If it's done wrong, you can get a nasty pile of mush that resembles a cross section of your backyard compost heap. The TJ's brand winds up somewhere in the middle. It seems to follow the formula we've seen in many of the previous items we've reviewed: a frozen item that thaws nicely, has a decent texture overall, but winds up tasting a little bland for some reason. The item is moderately priced at $3.99, and it manages to avoid any weird aftertastes or sub-par ingredients. It might not look very big, but it was plenty of food for both of us. Our two biggest complaints were lack of flavor and the choice to use shredded beef instead of ground beef. The meat wasn't bad, but really, I can't figure out how you could possibly get red meat to taste so bland. And it was just a bit stringy. I think ground beef works best for Shepherd's Pie. Somehow, none of the ingredients were flavorful. Peas, carrots, corn, green beans, mashed potatoes and beef should simply have more taste than this Shepherd's Pie offers. But wait! Trader Joe's Jalapeño Pepper Hot Sauce to the rescue! Hot sauce helps anything. 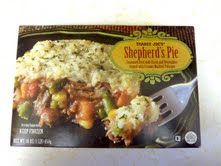 We figure this Shepherd's Pie must just be a shameless promotion for the TJ's hot sauce. We added salt and pepper, too, before we were really happy with the flavor. But, after the addition of said condiments, we really enjoyed our makeshift Mexican Shepherd's Pie. We both give this a 3 out of 5. Shepherds are simple folk, and they might appreciate the lackluster taste of this dish. Cravers of more bold tastes might want to check it out to satisfy their curiosity, but they'll want to be heavily armed with hot sauce before they heat it up. Bottom line: 6 out of 10. I also find this dish to be very bland, and I often add a good amount of salt and red pepper flakes. However I dont think that the choice of meat was bad. I would have hated to have ground beef in this product. True the meat might be slightly stringy, but I like meat that way, it reminds me of stewed meat from my childhood. Just to clarify, stringy in this case does not mean tough or chewy, rather, that the grain of the meat is particularly present. I bought this for my husband to eat and he was very disappointed with it. There was hardly any meat or vegetables (other than potatoes. It looked nothing like the picture on the box. When cooked, it was about an inch and a half of potatoes topping MAYBE a half inch of meat/veggies (if that). And it was bland. Spouse-y did not like it. There's a time and place for this. It's one of my favorite "sick" foods. I like to eat it when I'm recovering from an illness and want something bland and easy to prepare. I love this dish, but I always add lots of butter to the potatoes, and sometimes sour cream. Also salt and pepper. That cures the blandness. After all, Shepherd's Pie IS a bland dish. Oh, and I should add that we have made this in the microwave and in the oven. It is MUCH better when you use the oven. That may be why others find it bland. Takes longer, but like most things, it works better. Sorry I didn't read reviews first. It was not topped with mashed potatoes;it was all mashed potatoes with a few bits of shredded beef and the odd pea, carrot and corn kernel stirred in. It was nothing like what was pictured. No gravy to be found and I counted ONE string bean. Made it in the oven, too. It should be called flavored mashed potatoes. It was bland. Definitely not a keeper.